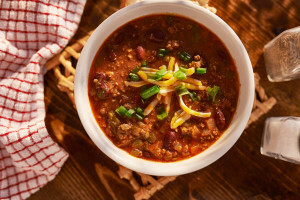 Tuck Into National Chili Month With This Recipe! Indulge in this easy southwestern beef chili this October! Did you know that October is National Chili Month? Not only is this Southwestern Beef Chili recipe easy to prepare, but it’s perfect for October! The fall brings cooler weather which commands the need for warming, cozy food for those dark nights. Tuck into some delicious chili tonight! Add olive oil to a large saucepan over medium-high heat. Add carrots, onion, garlic, salt. Stir for approx. 3 minutes until onion browning. Add the beef, break it up with a wooden spoon, and cook until no longer pink. Approx. 3 to 5 minutes. Add tomato paste and cook. Stir until it is slightly darkened, 1 minute. Add beans, green chiles, chili powder, beef broth, and ½ teaspoon of salt. Simmer over medium heat until the vegetables are tender, about 10 minutes. Divide among bowls and top with the cheddar and scallions! From the team at Robert J. Los Insurance Agency, we hope that you enjoy Chili Month with this delicious, family-serving chili! So that you get all of your insurance policies at a reasonable rate with excellent coverage, contact us, located in Hamburg, New York.